Both hormone dependent (AF-2) or the hormone independent (AF-1) function are required for the growth of the milk ducts during puberty and thereafter. 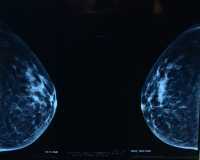 The estrogen receptor has an important role in breast cells that were previously thought not to express the receptor. The role of the estrogen receptor is different in different cells depending on whether it is present in high amounts or low amounts. The role of the estrogen receptor depends on the physiological context. In puberty the estrogen receptor stimulates growth, during pregnancy it does the opposite, it inhibits growth. Response: Our current immunohistochemistry-based assessment of estrogen receptor status that distinguish estrogen receptor positive and estrogen receptor negative cells are overly simple. The estrogen receptor is more versatile than we thought. Response: More attention needs to be paid to the amount of estrogen receptor in a cell, the concentration of estrogens and the physiologic context in order to gain more insights into breast cancer development, prevention and therapy of the disease. This entry was posted in Author Interviews, Breast Cancer, Nature and tagged breast cancer, estrogen receptors, medical research by Marie Benz MD FAAD. Bookmark the permalink.